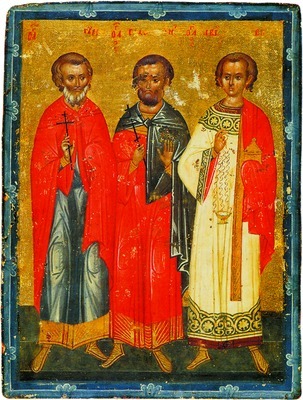 Christ our God, You have granted us the miracles of Your holy martyrs / Gurias, Samonas and Abibas, / as a stronghold and protection. / Through their prayers, strengthen those in authority in every good deed, / for You alone are merciful and the Lover of mankind! You received grace from on high, all-praised martyrs, / and you intercede for those in the midst of temptations! / Therefore, holy ones, you freed a young woman from bitter death. / You are indeed the glory of Edessa and the joy of the world!